Gwen Jacinto-Cariño is first and foremost a mother to 14-year old Sabine, 1-year old Silver and a wife to photographer Robbie. 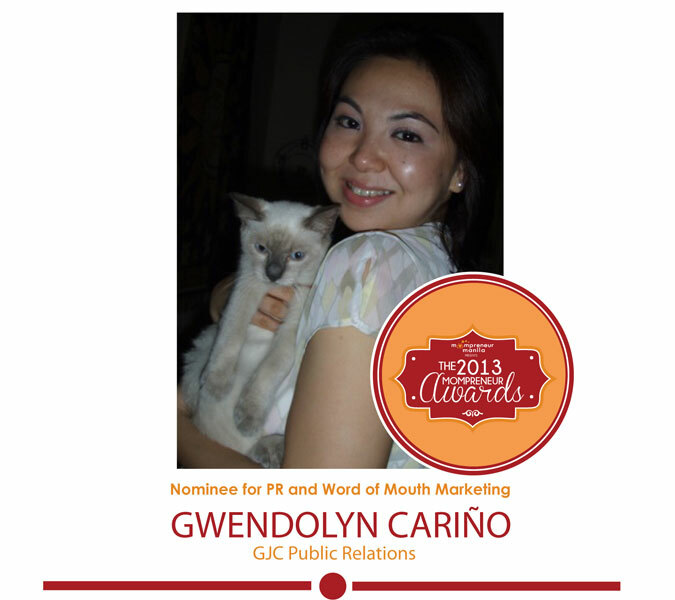 In the course of her career, she has dabbled in advertising, marketing, communications and public relations during her rewarding tenure as junior reporter of the News & Public Affairs Department of GMA 7; as PR officer of the Manila Hotel; and PR director of FOX International (then STAR Television Network), among others. Because of her priority as a mother and parenting advocate, she has since gone freelance, choosing a home-office set-up to establish her own PR and events agency, GJC Public Relations. Today, with almost 2 decades of professional practice, she is best recognized with the work she has done for the Discovery Leisure Group, the Raintree Restaurant Group, PLDT-Smart Foundation, Enderun Colleges, Disney Channel, Goody Philippines and Johnson & Johnson among others. One of the campaigns she developed which she considers most relevant as a mother and parent is that for the Philippine Parenting Convention that garnered the award of excellent media campaign in the Anvil Awards – the Oscars of public relations. Gwen is also the co-founder of Best Food Forward, an annual charity food fair that aims to happily give newcomers and home-based businesses an avenue to prove their worth in the bustling food industry. She is also publicist to some of the country’s top chefs, a contributing writer for the parenting magazine, Celebrity Mom, a passionate traveler, a cat lover, a frustrated painter, and a foodie by choice.